However, that would be a bit churlish—and when it comes down to it, authors depend upon the goodwill of their readers. So, as best I can, here goes. The first book in the series, obviously, is 1632. That is the foundation novel for the entire series and the only one whose place in the sequence is definitely fixed. That’s because 1633 has a sequel which is so closely tied to it that the two volumes almost constitute one single huge novel. So, I suppose you’d do well to read them back to back. That sequel is 1634: The Baltic War, which I also co-authored with David Weber. 1632, 1633, 1634: The Baltic War, 1635: The Eastern Front and this novel constitutes what can be considered the “main line” or even the spinal cord of the entire series. Why? First, because it’s in these five novels that I depict the major political and military developments which have a tremendous impact on the entire complex of stories. Secondly, because these “main line” volumes focus on certain key characters in the series—Mike Stearns and Rebecca Abrabanel, first and foremost, as well as Gretchen Richter and Jeff Higgins. Once you’ve read 1632, Ring of Fire, 1633 and 1634: The Baltic War, you will have a firm grasp of the basic framework of the series. From there, you can go in one of two directions: either read 1634: The Ram Rebellion or 1634: The Galileo Affair. There are advantages and disadvantages either way. 1634: The Ram Rebellion is an oddball volume, which has some of the characteristics of an anthology and some of the characteristics of a novel. It’s perhaps a more challenging book to read than the Galileo volume, but it also has the virtue of being more closely tied to the main line books. Ram Rebellion is the first of several volumes which basically run parallel with the main line volumes but on what you might call a lower level of narrative. A more positive way of putting that is that these volumes depict the changes produced by the major developments in the main line novels, as those changes are seen by people who are much closer to the ground than the statesmen and generals who figure so prominently in books like 1632, 1633, and 1634: The Baltic War. Of course, the distinction is only approximate. There are plenty of characters in the main line novels—Thorsten Engler and Eric Krenz spring immediately to mind—who are every bit as “close to the ground” as any of the characters in 1634: The Ram Rebellion. We come now to Virginia DeMarce’s 1635: The Tangled Web. This collection of inter-related stories runs parallel to many of the episodes in 1635: The Dreeson Incident and lays some of the basis for the stories which will be appearing in the next anthology, 1635: The Wars on the Rhine. This volume is also where the character of Tata who figures in Eastern Front and Saxon Uprising is first introduced in the series. You should then backtrack a little and read 1635: The Papal Stakes, which is the direct sequel to 1635: The Cannon Law. Then, read Ring of Fire III. My story in that volume is directly connected to 1636: The Saxon Uprising and will lay some of the basis for the sequel to that novel. After that, read 1636: The Kremlin Games. That novel isn’t closely related to any other novel that has yet come out in the series, though, so you could read it almost any time after reading the first few volumes. Thereafter, the series branches out even further and there are several books you should read. I’d recommend the following order, but in truth it doesn’t really matter all that much which order you follow in this stretch of the series: 1636: Commander Cantrell in the West Indies picks up on the adventures of Eddie Cantrell following the events depicted in 1634: The Baltic War. 1636: The Cardinal Virtues depicts the opening of the French civil war which was also produced by the events related in The Baltic War and which has been foreshadowed in a number of stories following that novel. Iver Cooper’s 1636: Seas of Fortune takes place in the Far East and in the New World. The portion of it titled “Stretching Out” may have some spoilers to Commander Cantrell in the West Indies and vice versa, but nothing too important 1636: The Devil’s Opera takes place in Magdeburg and might have some spoilers if you haven’t read Saxon Uprising. My co-author on this novel, David Carrico, also has an e-book available titled 1635: Music and Murder which contains stories published in various anthologies that provide much of the background to The Devil’s Opera. 1636: The Viennese Waltz comes after Saxon Uprising in the sense that nothing in it will be spoiled by anything in Saxon Uprising but you might find out Mike’s whereabouts early if you read it first. On the other hand, the e-book 1636: The Barbie Consortium (the authors of which are Gorg Huff and Paula Goodlett) is a direct prequel to Viennese Waltz and should be read first to introduce you to the young ladies dancing the Viennese Waltz. 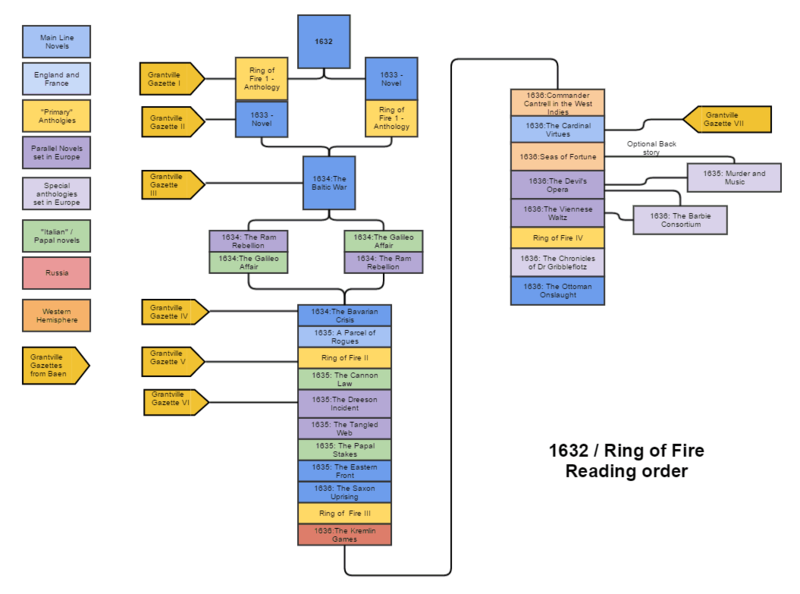 1636: The Viennese Waltz is also one of the three immediate prequels to the next main line novel in the series, which is 1636: The Ottoman Onslaught. The book is scheduled for publication in January of 2017—a year from now— and, as is true with most of the main line novels, I’m the sole author. If you’re wondering, the other two immediate prequels are 1636: The Saxon Uprising and my short novel “Four Days on the Danube,” which was published in Ring of Fire III. As long as I’m foreshadowing titles that’ll be published in 2016, the next volumes coming out after 1635: Parcel of Rogues are these two: Ring of Fire IV (forthcoming May, 2016). There are a number of stories in this volume written by different authors including David Brin. From the standpoint of the series’ reading order, however, probably the most important is my own story “Scarface.” This short novel serves simultaneously as a sequel to The Papal Stakes and The Dreeson Incident, in that the story depicts the further adventures of Harry Lefferts after Papal Stakes and Ron Stone and Missy Jenkins following The Dreeson Incident. 1636: The Chronicles of Dr. Gribbleflotz, by Kerryn Offord and Rick Boatright (forthcoming August, 2016). As with The Devil’s Opera, this is a story set in the middle of the United States of Europe as it evolves. In this case, relating the adventures of a seventeenth century scholar—a descendant of the great Paracelsus—who becomes wealthy by translating the fuzzy and erroneous American notions of “chemistry” into the scientific precision of alchemy. That leaves the various issues of the Gazette, which are really hard to fit into any precise sequence. The truth is, you can read them pretty much any time you choose. Finally, I’d recommend reading the most recent Gazette volume—that’s Grantville Gazette VII, published in April of 2015—any time after you’ve read 1636: The Cardinal Virtues. And… that’s it, as of now. There are a lot more volumes coming. For those of you who dote on lists, here it is. But do keep in mind, when you examine this neatly ordered sequence, that the map is not the territory. Scroll down for the graphical version if you like flow-charts.